In 5 days we will officially be in the fall season and I am beyond excited. One of my favorite things about the cold weather (I have hundreds, but let's stick to just one this time!) is enjoying a warm cup (or bowl) of soup. It just doesn't feel right eating hot soup on a hot day. So, the fall season is upon us and Progresso is helping me (& one of you) gear up for the cool weather! First, they have just released two new soups - and let me tell you, I LOVE trying new things! 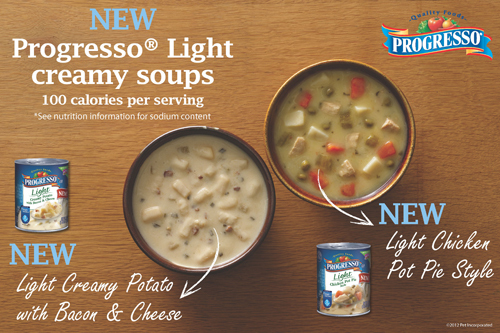 The new soup varieties are Light Creamy Potato with Bacon & Cheese, which boasts pieces of potato with savory bacon and rich cheese flavor, and Light Chicken Pot Pie Style, which exudes a home-style essence with cuts of white-meat chicken, hearty potatoes and classic vegetables. How tasty do both of those sound? 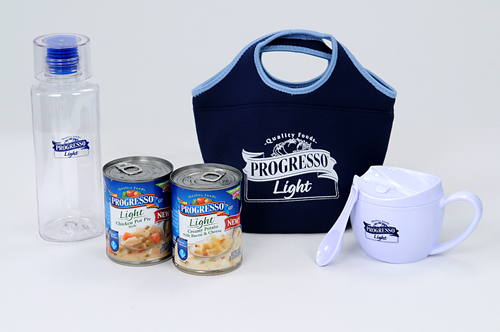 Second, Progresso has provided me (& soon, one of you) with a great Progresso Light gift pack. The gift pack includes a soup mug, lunch tote, water bottle and both of the new soups, Light Creamy Potato with Bacon & Cheese and Light Chicken Pot Pie Style. I would like the Light New England Clam Chowder. I like the light New England Clam Chowder. I would like to try the Light New England Clam Chowder and Italian Style Meatball. I'm a chowdah fan!!! but the chicken pot pie does look yummy!! Progresso is our family fav and we buy up all winter long!!! I would love to try the Light Creamy Potato with Bacon. Thanks for the giveaway and your wonderful Blog. I like the Clam Chowder.. so yummy & so filling!